When an area of paper or card is embossed, the results are that it sits higher than the surrounding paper. This brings the chosen section out of the card and raises it, creating a three-dimensional effect that draws the attention of whoever’s looking at it. It’s perfect for smaller pieces, like business cards that want to create a key focal point that you’re drawn to. A company logo, for example, is perfect for embossing as it’ll be the first thing that anyone sees. Foil printing can be a unique and effective way of adding the finishing touches to your printed materials. 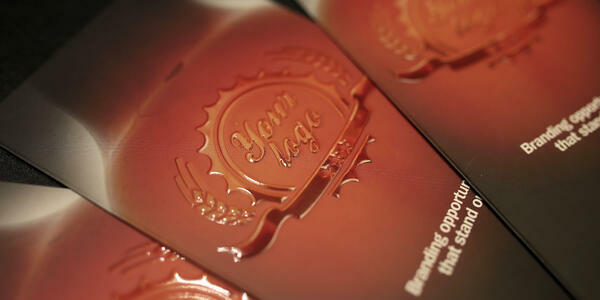 It’s achieved by using foil film and heated metal dies to transfer a thin layer of foil onto the paper or card. It’s easier to apply foil prints to embossed areas because the foil can easily be transferred to the raised sections without impacting the rest of the design. With debossed designs, it’s harder to achieve a clean transfer, although not impossible. Because of the way that debossing is carried out, some of the very finer details are sometimes lost in the printing process. It can be a little easier to see every tiny line and curve of a design if it’s embossed. This is useful if you’re looking to print your company logo onto a leaflet. You’ll need to make sure the logo is clear and easily recognisable, so embossing might be the right choice in this instance. Just as embossed designs leap from the page, debossed ones sink beneath it. This effect adds depth to any design, perfect for making the finished product look elegant and sophisticated. Because the debossed area sits lower than the rest of the material, it’s discreet and elegant. It’s less obvious than embossed designs which is sometimes what clients are looking for, especially if they want to create something understated yet beautiful. Blind debossing simply presses the design onto the material you’re printing on without adding any further decoration or colouring. But, if you’re looking for a design that’s really going to stand out, ink can be used for a fantastic splash of colour. Ink is easier to apply to debossed designs as there’s no danger of it running onto any of the other sections. Embossed designs are raised above the material, meaning they’re more subject to general wear and tear. They can be damaged or become worn over time. Alternatively, debossed prints are protected by design. As they sit lower than the surrounding area, they aren’t subjected to the same wear and tear. This ensures that the designs are permanent and always keep their shape. There are a lot more similarities than differences when it comes to embossing and debossing. Both have their benefits so a lot of the time it can come down to the personal preference of the designer. Experiment with samples of both to see which you think best suits your project. If you were creating business cards, leaflets or brochures that were made from paper or card, then embossing might be the better course of action. You’re able to create designs that jump out at customers and draw their attention to important information. Debossing is usually chosen when working with other materials, like leather. Their three-dimensional, in-depth designs are understated and sophisticated. Having said that, there’s no right answer and it’s worth speaking to a print expert for their opinion before committing to one or the other. B&B Press has been providing high-quality prints for the last 60 years, working hard to meet the requirements of our clients. One such project was for Beatson Clark, leading glass packaging manufacturer. Beatson Clark offers their clients the chance to emboss logos or designs onto their bottles. Instead of a basic leaflet, we suggested an embossed version that gave prospective customers a clearer idea of what they could get from Beatson Clark. The Beatson Clark leaflet is just one of many projects we’ve worked on over the last six decades. For a closer look at the techniques we use, including embossing and debossing, make sure to download our free Job of the Year Handbook. It showcases some of our favourite jobs from over the years. Click the link below to download your copy.